According to Weatherbys, who administer horse racing under contract from the British Horseracing Authority (BHA), naming a horse can, and should, be an enjoyable process. Some horses are named logically, according to their pedigree; Red Rum, for example, was sired by Quorum out of Mared. Some are named after something significant to their owner; Arkle and Foinavon, for example, were both originally owned by Anne Grosvenor, Duchess of Westminster and were named after twin mountains near her estate in Lochmore, Sutherland in north-west Scotland. Others are named for pure devilment, which is why Weatherbys states that all names registered are subject to approval by the BHA. Aside from the length of the name, which can be up to 18 characters, including spaces, the BHA imposes some fairly strict rules to prevent owners from causing confusion or offence by naming their horses inappropriately. Nevertheless, over the years the regulatory body – that is, the BHA, or its predecessor, the Jockey Club – has occasionally dropped a clanger and allowed the registration of a name that, as stated in the current BHA rules, ‘is suggestive or has a vulgar, obscene or insulting meaning’, ‘is in poor taste’ and may cause ‘offence’ and/or ‘confusion’ in the world of horse racing and beyond. Unless you have an especially sensitive disposition, the outcome has been, more often than not, just plain hilarious. Geespot, for example, was a bay mare trained by Dominic Ffrench Davis, won a couple of selling races at Brighton and Lingfield in 2002. Sired by Pursuit Of Love out of My Discovery she was, unquestionably, ingeniously named. Nevertheless, even taking into account a euphemistic play on ‘gee-gee’, as slang for a horse, probably erred on the side of generosity in allowing her to be so christened. 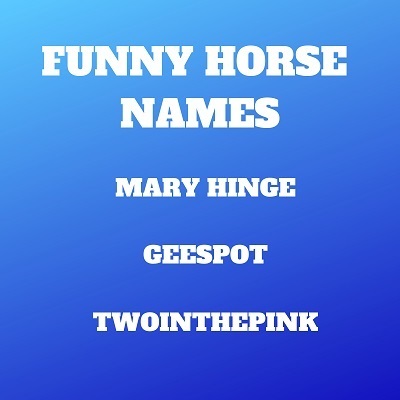 The spoonerstic Mary Hinge – the original name of a character in the Kenny Everett Television Show in the Eighties, which was rejected by the BBC, for obvious reasons – was a flagrant error on the part of the naming ‘gatekeeper’, but nonetheless graced the winners’ enclosure five times in 1993 and 1994. 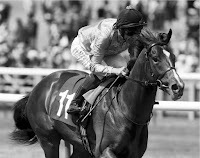 Owned and trained by Julie Cecil, the former wife of the late Sir Henry Cecil, the bay mare was the scourge of racecourse announcers and commentators for the majority of her 11-race career, finishing out of the first three just twice, on her last two starts. More recently, Two In The Pink was another, equally unbelievable, addition to the roster of dubious names and belonged to a three-time winner for Ralph J. Smith in 2013 and 2015. If you are not a fan of comedian Jimmy Carr, suffice to say that the name is short for a sexual act, known in some quarters as the ‘Shocker’; Cosmopolitan even has instructions on how to do it!